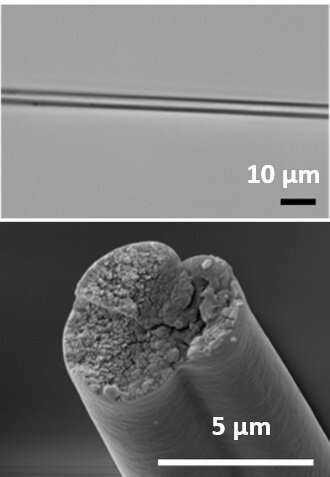 If produced in sufficient quantities, spider silk could be used for a variety of applications, ranging from bullet-proof fabric to surgical sutures. But spider silk isn't easy to farm—spiders produce tiny quantities, and some species turn cannibalistic when kept in groups. Therefore, scientists have tried engineering bacteria, yeast, plants and even goats to produce spider silk, but they haven't yet been able to fully replicate the natural fiber's mechanical properties. In addition to applications here on Earth, the bacterial protein production system could be helpful during space missions, Zhang notes. "NASA is one of our funders, and they are interested in bioproduction," he says. "They're currently developing technologies in which they can convert carbon dioxide into carbohydrates that could be used as food for the microbes that we're engineering. That way, astronauts could produce these protein-based materials in space without bringing a large amount of feedstocks." More information: Synthetic Biology for Microbial Production of Protein-based Materials, the American Chemical Society (ACS) Spring 2019 National Meeting & Exposition.